The dichotomy, biasedness, partisanship has creped in entire Indian body politic, almost in every important institution of India with media being no exception to it. Neutrality and unbiased approach is the symbol and true spirit of journalism, but Indian media has always tried to be loyal and innocuous enough to bury the ethics of media under the debris of so called national interest in Kashmir. It is this which makes them to cover their cameras with their eyes too when Kashmiris are victimized, vituperated and writhing in pain, inflicted by so called custodians of law. But their adrenalin runs high when it comes to counter the often repeated “separatist campaign supported from across” which makes them vocal and articulate in their mad and senseless sensationalism good enough to bring two nuclear armed neighbors to the brink of war. Indian media does ‘great and yeomen’ service to their nation by projecting victim as guilty and guilty as innocent. The cries of Shopian and Kunanposhpora not strong enough to break the belligerent glasses of their ‘national interests’ and clear their jaundiced vision, they puff chests in pride while twisting facts in Kashmir. Indian media today is in whirlpool of duplicity and double standards. Where every thing goes in line with the power corridors of New Delhi and objectiveness and balanced reporting is shown the exit door. About politics and their Kashmir policy it is for every one to see, it is here where justice, human rights, democracy and all universal values are vomited out before crossing over to Jawahar Tunnel. A classical example of hypocrisy where Gandhian principles are talked about but even peaceful protests by a besieged and oppressed population is labeled as “agitational terrorism” deserving nothing but bullets and tear gas canisters that too directly on their chests and heads to make way for ‘complete national integration’. Where young ones are taken as enemy agents and imprecations on national security. Where resources are plundered and pennies are offered back to an ‘undeserving’ lot. Where Kashmiris have exclusive rights on Indian Bullets but all this appears blur in front of ‘glamour’ of Indian media. Eight young souls have fallen prey to the military prowess of Indian forces since the beginning of 2010. Bolstered with the unbridled powers, the security forces have become reckless and callous with least regard for human life. They easily escape from any sort of accountability and enjoy the freedom to kill whom they like. Kashmir is nothing but a combatant zone where they (security forces) have been deployed to restrict, stifle and muzzle the voice of people. According to Universal Declaration of Human Rights, it is essential, if man is not to be compelled to have recourse, as a last resort, to rebellion against tyranny and oppression, that human rights should be protected by the rule of law, which is rarely seen in Kashmir. As even peaceful protests by Kashmiris demanding their right of self determination, promised by India, are being dealt with iron fist. But how bizarre it is, on the part of India which claims to be world’s largest democracy, to backtrack on its own promise so brazenly and then lay claim for permanent membership of UNSC of whose resolution it is continuously violating. Against the solemn pledges of its founding fathers and relentless struggle of the people of Kashmir, India can’t escape from its international obligation of granting Kashmiris the right of self determination. Time cannot abrogate moral values and commitments nor invalidate international community’s right to intervene in conflicts arising from denial of freedom. We have the example of East Timor, where a dispute was settled through a reference to the wishes of people under UN supervision, where Indonesia upheld people’s verdict. How shameful for India that on one hand it parrots peace to the world and is proud of its peacekeeping efforts in many parts of world as in DRC, MONUC and on another hand dreaded killers and extortionists whose hands are drenched red by the blood of innocent Kashmiris who are demanding nothing but the life of their own choice. Kashmir dispute is lingering because of hypocrite attitude of Indian leadership and with it the peace and security of South Asia is in peril, though subtle the re-engagement of India and Pakistan is a welcome step but needs to be followed with sincerity and without any pre-conditions attached to it, but yes talks which sans Kashmiris are bound to fail as is evident from the past. Kashmiris are the real stake holders as their every thing is on stake, neither they nor their national aspirations can be kept aside forever. This refers to the denial of proper treatment to senior pro-freedom leader Shabir Shah which is condemnable to say the least. 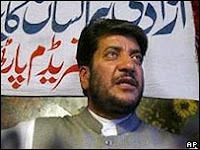 Shabir Shah has spend more than half of his life in torture chambers, interrogation centers and various jails of India for espousing the cause of unfettered right of self determination of people of Jammu and Kashmir. The denial of medicare to Shabir Shah which has created heavy impact on his health is sheer vendetta on the part of authorities which want to stifle and muzzle the voice of dissent. The arrests and detentions can’t dampen spirit of those who are committed to the cause. He has all along fought peacefully for the right which has been recognized by international community under the auspicious of UN’s Security Council and according to international conventions and norms for political rights. Denial of proper treatment amounts to criminal negligence and a malicious intent to harm him physically after failing to browbeat his sentiments, which doesn’t suit the advocates of ‘peace and democracy’.